Download this peace sign computer wallpaper for free, as part of Top Pun's free for all campaign to promote peace. Use this peace sign wallpaper on your home or office office computer. Feel free to share this free wallpaper with friends and enemies alike! Just due it! Top Pun is the proud owner of the World's Largest Peace Sign Web Store, featuring about 1,500 peace signs-peace symbols on your choice of products. Browse the Peace Sign Store. 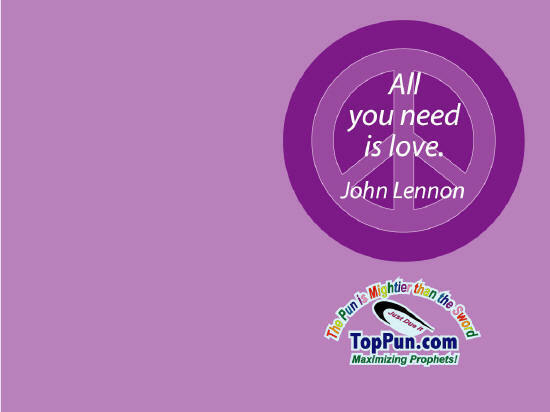 Download Free Peace Sign Wallpaper (1024 X 768) - "All You Need is Love"
"Books Not Bombs Peace Flag"
"Hippie Flower Power Peace Sign"
"All You Need is Love Peace Sign"
"Red on Blue Peace Sign"
"Disturbing the War Peace Sign"
Top Pun is the unofficial outfitter for the U.S. peace movement. Please feel free to download these free peace sign wallpapers and pass them along to others. If you like these free peace sign wallpapers, try these free peace sign posters. Download free peace sign stuff for all!